Covenant Christian Fellowship International, Inc.
Worship, Fellowship, Service, Training and the Arts. The PURPOSE of CCFI is to serve as a covering for ministries throughout the world who want to move with the flow of God, sharpen their spiritual ears so that they are in a continual mode of hearing what God is saying to the church, study continually in order to rightly partition God’s word, and yield themselves so that the Holy Spirit can demonstrate His power through them. We further purpose to raise up ministers in the Five-Fold order according to Ephesians 4:11, equip and train so that the work of evangelism is carried out, and the Gifts of the Spirit are in full operation until the return of Jesus our Christ. Furthermore, the purpose of CCFI is to provide support (spiritual, educational, and practical) and fellowship for its member churches/ministries. The mission of CCFI is to evangelize the world, and to equip and train ministerial leaders by any means necessary, as the Holy Spirit leads. This includes, but is not limited to, facilitating workshops, seminars, conferences, revivals, dramatic productions, streetministry, and the like. Furthermore, our mission is to support our works abroad through the teaching of the Word, supplying ministerial tools, providing aid to those ministries who are caring for orphans and God's precious ones who are living with HIV/AIDS and/or other life-threatening illnesses/conditions, and taking the travel team abroad when deemed necessary. The vision of Apostle Adé is to see the Body of Christ grow into the Head, which is Christ. This growing will cause the Body to transform its nature of dogma and doctrine first, to following the leading of the Holy Spirit first and foremost. And as we transform to spirit first, to following the leading of the Holy Spirit first and foremost. And as we transform to spirit first, we will operate in the demonstrated power (dunamis) that we have been endowed with, which will cause unbelievers to believe and surrender their lives to Jesus Christ. Furthermore, we envision planting churches throughout the United States and abroad. Our churches will be Spirit-led and Spirit-filled so much so that we fully expect to see signs and wonders in our meetings. We envision leading the masses to Jesus through our love, praise, worship, biblical and practical teaching, and the continual sacrificing of our flesh so that we are always in a posture to usher in God's presence. Our worship is authentic. The freedom to reverence Abba Father through our mouths, hands, feet, dance, and music is fully welcomed in our services, conferences, and outreach ministries. We worship him in Spirit and in Truth. We compare spiritual with spiritual; therefore, you will experience the spirit of the living God when you join us! Not only do we fellowship with churches and ministries within our ecclesial body, we believe in the importance of fellowship with others within the Body of Christ so that we are all edified, as well as with those who are not yet apart of the Body of Christ, so that they will soon want to be, because of their fellowship with us. CCFI believes in service! We follow the many examples that Jesus left for us, as we understand His life of service. Our service includes: feeding those who are hungry, providing clothing, visiting the sick and shut-in, pastoral counseling, ministry and fun with senior citizens, career readiness training, and partnering with others to bring about humanitarian aid. Ephesians 4:12 identifies one of the many duties of the Apostolic Government of Christ: "For the perfecting of the saints, for the work of the ministry..." We believe that training is paramount to good, effective ministry. All ministers who are licensed and ordained under CCFI's auspices undergo spiritual, educational, and practical training so that they are well-adept at handling the many challenges that come with caring for souls. Furthermore, we offer quarterly summits that focus on spiritual direction with real-life challenges. CCFI is filled with souls who have been gifted artistically. Apostle Ade is an author and dramatist, and many of the art's focus is centered around theatrical productions. We believe that drama can be used as a tool for healing and freedom. Soon, our artistic arm, "It's Due-Time Productions" will have a community theatre that will bring in talent from our various communities. Apostle Ade’ is the Chief Apostle & Presiding Prelate of Covenant Christian Fellowship International, Inc. Born in Philadelphia, Pennsylvania. She is a wife, mother, grandmother, educator, relationship counselor, Kingdom Life Coach, songwriter, poet, playwright, published author, and director. In March 1987, Dr. Ade’ was licensed into the ministry of our Lord, and in July 1988, she was ordained; both, under the auspices of the Sanctuary Church of the Open Door, in Philadelphia, Pa., and under the tutelage of the Rev. Dr. Audrey F. Bronson. In July 1988, Dr. Ade', and her family, moved to Atlanta, Ga. In 1991, Dr. Ade', birthed her first church: the Sanctuary Church of the Living Word, in Stone Mountain, Ga. Since then, her continuous journey as a preacher and teacher has been filled with fasting, prayer, untiring study, prophetic proclamations, and divine impartations from Apostles, Prophets, Evangelists, Pastors, and Teachers. Through those divine utterances and divine hands, the divine calling of Yeshua, and the anointing of the Holy Ghost, an apostle was birthed. In July, 2010, Apostle Ade' was called, by God, to the Five-Fold Office of the Apostle. On June 23, 2011, in Virginia Beach, Va., she was consecrated to the office of the Bishop under the auspices of the International Fellowship of Churches, Inc. However, since that time, God has reminded Apostle of the mandate that He placed on her, and that she is to fully acknowledge and operate in that calling. Apostle Ade' made the conscious decision to yield to and obey God's voice. Therefore, she is now fully operating in the calling, office, and anointing of the Apostle. Apostle Ade’ has served the Kingdom of God in the offices of Apostle, Pastor, Teacher, & Evangelist. Furthermore, she operates under a heavy healing and prophetic anointing, with signs and miracles accompanying her mantle. Apostle Ade' has a Kingdom mandate to set things in order by helping to restore the apostolic and prophetic to its rightful place in the Body of Christ. This mandate requires her to train, equip, establish, and send out effective ministers (who will bring the Kingdom of God with the power of the Word, signs, and miracles) into the vineyard in this End-Time Hour. Furthermore, after over 25 years of educating, ministering to, and counseling adults, this Kingdom mandate has propelled Apostle Ade' to assist others in reaching their goals and becoming all that God has predestined them to be, through her Kingdom Life Coaching Service. She specializes in Spiritual Growth, Marital Relationship Enhancement, and Life Balance through Stress Reduction. Apostle Ade’ believes that creativity has a divine place in God’s Kingdom. She has written creatively since the age of 14. She has written numerous poems, and two short stories. As a child, she performed in church plays and sang all over Philadelphia with her mother and brothers. In December, 2007, Apostle Ade’ staged her first play: "A Son’s Return" at her church. It is a remarkable story about the power of love and forgiveness at Christmas. In May, 2008, "Acts of Fire: Matthais’ Story" (a Pentecostal Musical), her first theatrical production, was staged at the Clayton County Performing Arts Center in Morrow, GA. In June, 2010, Apostle Ade' collaborated with the Sanctuary Village Ministries, in Atlanta, to stage, "Everything Through Everything," which was performed in Orlando, FL. Dr. Ade's plays have been staged in: Atlanta, Ga; Toledo, Ohio; Orlando, Fl; Virginia Beach, Va, and Philadelphia, Pa. In 2012, her urban fiction-novel, "Vancy's Journey" was published as an E-book. Reverend Kemel V. Brown was born on March 29, 1982, in Philadelphia, Pennsylvania. He began his elementary education in Camden, New Jersey. After moving to Atlanta, Georgia, with his family, he completed his secondary education in the Atlanta Public School System, followed to complete undergraduate college courses, and is completing his Bachelor’s degree in Business Administration at St. Leo University. Pastor Brown currently works as a teacher and preacher of the Word of God. Reverend Kemel Brown was anointed from his mother’s womb to bear the Gospel and at an early age began to exhibit signs that the anointing of the Lord was upon his life. Reverend Brown preached his first mini-sermon in kindergarten. In the midst of his teacher giving a lesson, he stood up and began to proclaim to his teacher and his classmates that they needed to know Jesus. While this proclamation was not necessarily appreciated by his teacher, it set precedence that he was not ashamed of the gospel of Jesus Christ. After beginning ministerial training under the tutelage of his parents, Elder Akinyele J. Ade’ and Chief Apostle Kinaya J. Ade’, Reverend Brown was licensed into the ministry in 1998 at the age of sixteen under the auspices of The Sanctuary Church of the Living Word in Atlanta, Georgia. 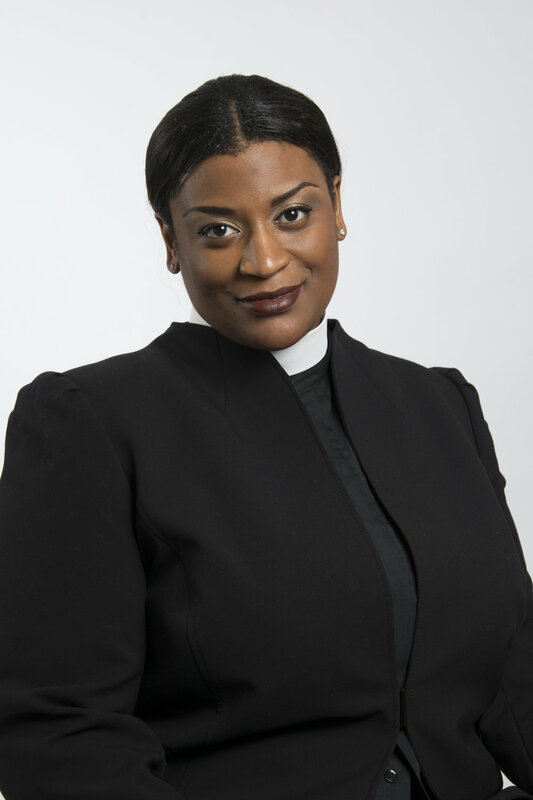 Reverend Brown was ordained in 2001 at the age of nineteen under the auspices of The Sanctuary Church of the Living Word and the International Fellowship of Churches, of which Bishop Audrey F. Bronson is the presiding prelate. After operating as Associate Pastor for many years after his ordination, Reverend Kemel Brown was installed as Pastor of The Sanctuary Village Ministries in the spring of 2011. In October 2011, Reverend Kemel Brown became the Founder of The Sanctuary Village of Power, Inc., and he currently presides as the Senior Pastor of The Sanctuary Village of Power. Who are you? A passionate lover of Jesus Christ! A radical worshiper, and a lover of God’s word and His people. I enjoy traveling, eating and laughing! What are you most passionate about in ministry? My ministry is about making the love of God tangible to people regardless of where they come from or who they are today. What are your gifts and talents to the Body of Christ? I am used primarily in Preaching, Teaching, and Praise & Worship. Tell us an interesting fact about you or interest that you have that few know about: I’m a foodie. I enjoy eating out and trying new types of cuisine. Elder Angela Callaway is a cherished wife, loving mother, author, businesswoman, life and relationship coach and visionary. She is married to Prophet Jonathan Callaway. She has two energetic sons named Grant (6) and Gabriel (5) Callaway. Elder Angela flows in the anointing of Teacher, Preacher and Prophetic veins of the five-fold. She is especially passionate and gifted in ministering to women. Professionally, Rev. Angela works in healthcare public relations. She is an awesome public speaker and trainer. Additionally she plans a variety of healthcare related events around the state of Georgia and works with the largest employer group in the state of Georgia. Angela released her first book, Everyday Power: How to operate in the power of God” August 2014. It is a thought provoking inspirational book to aid in daily operating in the power of God. Her second book is scheduled to be released January 2017. Outside of ministry, Angela enjoys her family, friends, reading and is an avid believer of personal growth. She is currently completing her M.Div. degree at Mercer University. She loves laughter and good fun! Her personal creed is Matthew 22:37-38 "You shall love the LORD your God with all your heart, with all your soul, and with all your mind. This is the first and great commandment." Who are you? Daughter, wife, mother, author, student, businesswoman, life and relationship coach, and visionary. I am married to Prophet Jonathan Callaway and have two energetic sons named Grant (6) and Gabriel (5) Callaway -- and yes, they act like their momma and daddy. What are you most passionate about in ministry? Living and sharing God’s amazing love for us. I am also very passionate about ministering to women. We pour out ourselves to the world and need to be poured into. What are your gifts and talents to the Body of Christ? I write, I sing, and I am funny! Tell us an interesting fact about you or interest that you have that few know about: I love to read fictional novels. I will take the day off, curl up with coffee/tea, and simply read for my pleasure. Elder Christopher E. Carter plays an integral role in both the spiritual and operational sides of ministry. As a caring spiritual leader, Elder Carter serves as a teacher of the word of God, a praise and worship leader, member of the church choir (Voices of Power) and an intercessor for Sanctuary Village of Power (SVOP). As an operational leader, Elder Carter serves as the Executive Pastor, Chief Financial Officer and leads the Church Growth Partnership of Departments (POD). The Church Growth POD consists of the following ministries: Finance, Ministers of Excellence, Member Services Media and Marketing, and Youth & Children’s Ministry. Who are you? I was born to A.C. and Evangelist Annie Carter on May 1st and raised in Senatobia, MS. Being reared in church, I have known all areas of ministry which made it easy for me to become a leader in the church. My upbringing taught me the true meaning of work and worship. I was licensed in June 2011 to preach and teach the Gospel by my Senior Pastor Kemel V. Brown, former Co-Pastor Angela Spann Callaway and my Chief Apostle, then Bishop-Elect, Kinaya J. Ade’ of Sanctuary Village Ministries, Incorporated. Shortly after I was licensed, Sanctuary Village of Power, Inc. was created via merger and my roles in ministry increased. I now serve as Executive Pastor of Sanctuary Village of Power, Inc.
What are you most passionate about in ministry? I am most passionate about mankind growing in the Kingdom. What are your gifts and talents to the Body of Christ? I am a teacher in the body of Christ. Tell us an interesting fact about you or interest that you have that few know about: One of my favorite things to do is sleep. A student, mother, successful business owner born in Camden, New Jersey, Prophetess Garrah Brown is the beloved House Prophet of the Sanctuary Village of Power. God began to use Prophetess Garrah in the prophetic at an early age through visions and dreams. It was through one of these dreams that God revealed the vision of what is now The Sanctuary Village of Power, Inc. In 2011 Prophetess Garrah was ordained to the office of a Prophet. She is now a proven prophet that offers wise counsel and direction to her ministry’s leaders and the flock, as she accurately hears, sees, and speaks the truths of God’s heart. Prophetess Brown remains a pillar of the ministry and sits on SVOP’s Senior Leadership Team. Not only does she accurately interpret the signs of the times, as the Resident Diva she discerns the fashionable dos and don’ts of each season on behalf of the local body. Prophetess Garrah serves as the Co-Director of the Beautification Ministry and is Director of SVOP’s ministry store. She uses her gifts and skill in fashion, interior design, as a buyer and a merchant to prosper the ministry. Who are you? I am the house prophet of Sanctuary Village of Power. What are you most passionate about in ministry? I am most passionate about delivering God's word to His people, especially in this time. My desire is that the Body of Christ wake up and recognize what is going on in the spiritual realm. My assignment and my passion is to spread the word, the dreams, and the visions God has given me for His people. What are your gifts and talents to the Body of Christ? You can find me every Sunday on the praise team giving God praise. Tell us an interesting fact about you or interest that you have that few know about: Hot wings are my favorite food. I could eat them everyday. Elder Akinyele "Jaja" Adé is a husband, father, grandfather, elder, professional handyman, DJ, musician, and songwriter. He is the Chief Elder of Covenant Christian Fellowship International. Jaja was born and raised in Camden, N.J. Jaja has an extensive love of music and instrumentation, and he has been a percussionist for over 40 years in the Greater Philadelphia area with the gospel group Realize. He has played percussion for churches, theatrical productions, and organizations in the North and South. After being delivered from drug addiction many years ago, Jaja has a heart to help men free themselves from addiction and reunite with their families. Who are you? Chief Elder the husband of Apostle Kinaya Ade’ and the back bone of C.C.F.I. ; the man behind the scenes. What are you most passionate about in ministry? I am passionate about this ministry, and I love people, especially drug –addicted men that need the LORD. And I am passionate about all of the talent and the spirit that we have in this ministry. What are your gifts and talents to the Body of Christ? I am a musician, songwriter, and intercessor. Tell us an interesting fact about you or interest that you have that few know about: The Word says that people can overcome by the words of their testimony, alongside the blood of Jesus. I was a backslider and drug addict. I have been shot, stabbed, and my legs were pinned between a car and a gas tank. I lost everything -- no job; no home; no car; and, most of all, no family -- and GOD brought me back. Who are you? A God-fearing woman who adores all that God is. I try to live my life as if I could become one of His favorites. What are you most passionate about in ministry? I am passionate about souls. Assisting, and connecting someone to Christ excites me. What are your gifts and talents to the Body of Christ? Recognizing God’s omnipotence to use me as a vessel to connect others to Him by giving me insight. Tell us an interesting fact about you or interest that you have that few know about: Music gives me life. I love to cook, read, and jump double dutch. Yusuf Brown a.k.a. Big Pudge was born on the evil streets of Camden, NJ, with his parents and three younger siblings. Watching his dad DJ at parties day and night sparked a flame in his belly for Hip-Hop, while church on Sunday kept him grounded. When a drug epidemic hit the community in 1985, God kept his family from being statistics until they fled to Decatur, Ga, in 1988. Although Pudge was in church with his pastor and mother (Apostle Kinaya Adé), he stole away to the streets whenever he could, not realizing God was setting him up to eventually minister to the streets. He decided to dedicate his life to the Lord, accept his calling as a minister, and pour into the streets what God had poured into him. Yusuf believes the people he’s called to minister to are the ones outside of the four walls of a church. In addition to being a street minister, Yusuf also enjoys cooking and graduated from Atlanta Technical Institution with a degree in Culinary arts. God has also blessed Yusuf with the gift of writing, creating, producing music, recording, and editing. He also has a Videography business named SoulCaféPresents L.L.C. What are you most passionate about in ministry? I am most passionate about souls being saved. I'm Christ-like driven and I am to walk like Him, so my biggest passion is the same as Yeshua's. Tell us an interesting fact about you or interest that you have that few know about: I would rather hang with sinners that have a desire to be saved & delivered than with most people. Why? Because Jesus broke bread with robbers, killers, & thieves. He healed people that didn't love him. We are to be like Christ. Few people can be around sinners and be comfortable, and I'm the opposite. Keep up with our fellowships by way of photos and videos by clicking here! In 2013, Covenant Christian Fellowship International, Inc., (CCFI) initiated a national hour of prayer to stave the violence in our streets. We welcome everyone to stop at that hour and pray all across this country, especially in our inner-cities. Watch the video until it causes you to join us in prayer. Let's pray, so that your son, nephew, grandson, brother, husband, etc. is not senselessly murdered.